Firstly, how does the British Council quantify what is essentially quite an ephemeral idea? Essentially, it begins by breaking down the relative ‘importance’ and value of a language into three categories: Economic (including current and future trade priorities, as well as emerging and declining markets), Non-Market Factors (being tourism, international educational engagement, diplomatic necessities and tourism priorities), and finally Balancing Factors (such as relative EFL ability in foreign nations and the prevalence of languages online). One of the most significant of these with the approach of Brexit is the necessity to communicate with non-European Markets, as well as the potential decline of export to the United States, meaning languages like Mandarin, Japanese and Arabic are becoming more sought after. On the other hand, a booming tourism industry in European countries still sees languages like French, Spanish and German well represented. So; what has changed, and what’s stayed the same? 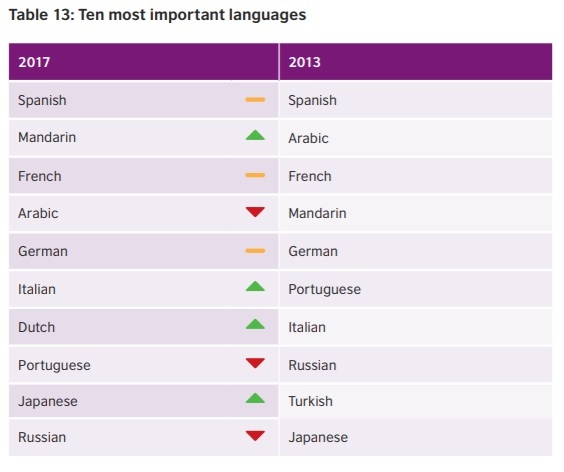 Spanish remains the top language for British speakers to learn since 2013. With over 400 million speakers worldwide, not just in Europe but in Latin America also, it has consistently held the top spot and is also considered one of the easiest and fastest languages for English speakers to learn. It is also a language spoken widely on the internet and in business. Similar is French, sticking at the number 3 spot. In addition to being spoken in France and Canada, it is also the language of many North-African countries which represent recently emerging economies. Indeed, it is the only language spoken on 5 different continents. In addition, French is a vital international relations language, being an official language of organisations such as UNESCO, the UN, NATO and more. For British people specifically, French is also a great language to learn due France’s proximity to the UK; and a hugely popular holiday destination along with Spain. German, which has always been a vital language of business remains solidly at rank 5. One of the most significant changes is the sharp rise of Mandarin and waning of Arabic in comparison. Cooperation with China is becoming a hot topic with the approach of Brexit. As relatively few Chinese people speak English in comparison to other countries, it is a very valuable language to learn for those who are willing. On the other hand, Arabic (specifically, ‘MSA’, being Modern Standard Arabic) is declining due to weakening economies and increasing levels of censorship in the Arab League. However, it is important to bear in mind that each of these languages is assigned importance based on ‘points’ gathered from the previously mentioned categories. 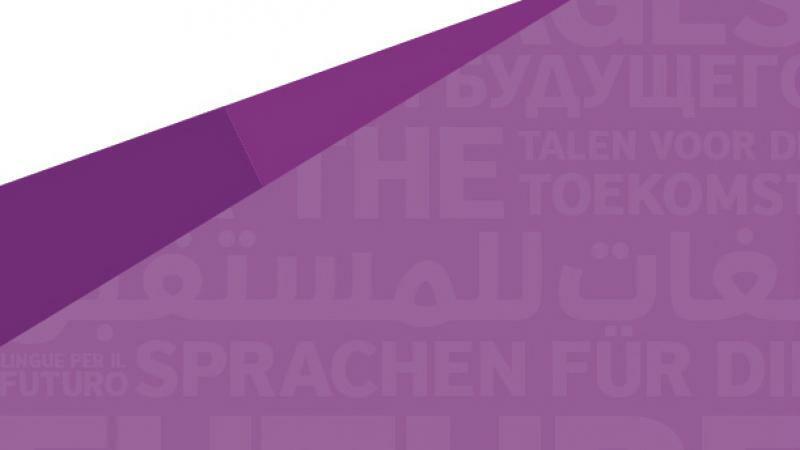 This is key as the British Council notes that the top five languages: Spanish, Mandarin, French, Arabic and German are notably above ranks 6-10. Even so, Portuguese, Turkish and Russian have all dropped in favour of rising Italian, Japanese, and newcomer to the top 10: Dutch. Dutch is a language that has roots very similar to German; which has a lot of cognates and shared syllabic qualities with English. This makes it relatively easy to learn for English speakers. Similarly, Afrikaans (one of the major languages of South Africa) is based on Dutch with a few differences. This means Dutch students almost learn two languages for the price of one! Ultimately, language learning is often quite a personal experience. Many people learn for their family or partner, for business or for holidays. Nevertheless, it is valuable to gain some perspective on how the language you are learning may sit on the global scale. In any case, with teaching experience in over 30 modern foreign languages, the Marlow Language Centre will be able to help with whatever language you need to learn, for any manner of reasons in a variety of course formats. All you need to do is contact us and one of our specialists can advise you on everything we can offer to help you on your language learning journey.